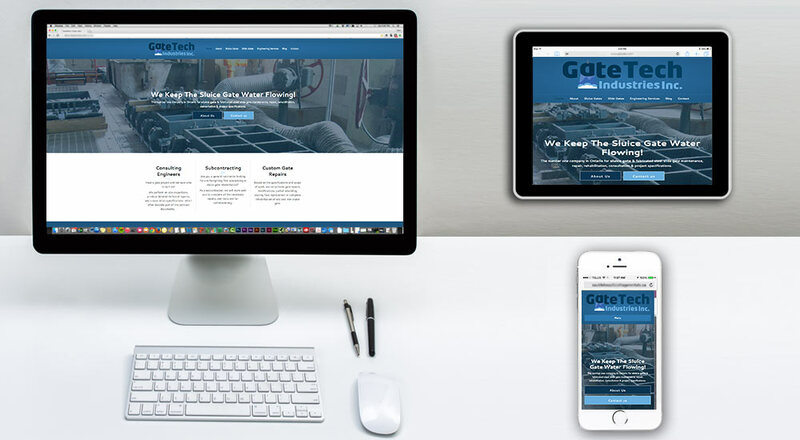 Gate Tech is a very interesting and unique Ontario engineering company that we had the pleasure of designing a logo and building a mobile friendly website for. Gate Tech specializes in installing, repairing and maintaining sluice gates and other types of water gates for many different applications. Working with Gate Tech was a pleasure as they were great to work with and responsive when we made requests for content or to clarify their desired intentions or what they believe would be desired by their users. First we started with the logo and brand design so that we could ensure we understood how they wanted to be represented to their target markets. We presented the client with 3 initial designs and by the end of our 3 revision cycle we ended up with a great looking logo that we felt really represents what it is these guys do. Our team believes they now have the most service representational and industry recognizable logo globally. They did a great job at describing what it was they were looking for when presented with revisions and it made it easy for our designer to really make the design more representative of this company. Since they’re such a unique company with a very niche market we wanted to ensure that their website was not only accessible and easy to use but had enough information to prove their competence and authority in their industry. We asked them a series of questions to help us figure out what types of people would be looking for their services and how they usually interact with these people. We didn’t want to change their process, just create a place for their clients to learn about them and contact them in a way that’s as easy as possible. We are now entering the next phase of our marketing plan and digging into a 3 month editorial calendar blogging plan to help the client showcase some of their really impressive projects and show interested customers what they can do. Google is all about giving search engine ranking position (SERP) love to quality content that is useful for target market customers. We’re all about providing Google search results! I read this article and found it very interesting, thought it might be something for you. The article is called Ontario Engineering Company Web Design releases with Marketing Strategy and is located at https://www.gemwebb.com/engineering-web-design/.